From ghosts and goblins to skeletons and witches, making craft decorations for Halloween is fun for the whole family. People decorate their homes and yards for Halloween in many different ways. A frightfully scary graveyard with tombstones and ghosts hanging from tree branches might be next door to a yard full of happy faced pumpkins, Casper the Ghost and a witch on her broomstick that crashed into a tree. Regardless of the kinds of decorations you love, making them is almost as much fun as Halloween itself. Halloween crafts range from simple paper plate pumpkins and egg carton bats that are easy enough for preschoolers to make to cute hanging welcome witches or scary tabletop ghosts that are fun for all family members to create. Your preschoolers will have fun making ghosts with plastic grocery bags and balloons on the Enchanted Learning site. Preschool Education offers dozens of Halloween crafts for preschoolers. This adorable fence with black cats looks great anywhere and is very easy to put together. Make a few mummies to put in a scary tabletop scene. A haunted house centerpiece is fun and festive. If you love spooky or scary decorations, these crafts are the ones for you. Excellent instructions for Halloween tombstones made form plastic foam are found on the HGTV website. Make a life size skeleton from plastic milk jugs. Enchanted Learning offers many great craft decorations for kids from kindergarten through third grade. 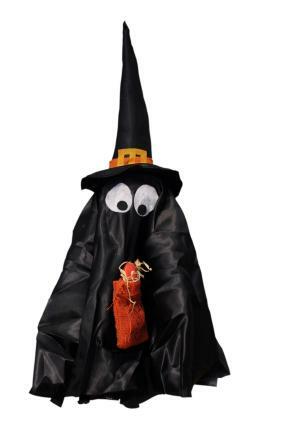 Hundreds of Halloween craft decoration ideas for kids are offered at Making Friends. Ben and Jerry's and Hershey's both offer instructions for Halloween craft decorations. Whether you make one Halloween decoration or a houseful, the enjoyment of making craft decorations for Halloween will last far beyond the holiday.